These three words illustrate what LH Lift’s couplings are all about. We make easy-to-use couplings that enable the job to get done, whether it is about mounting an implement and ploughing a field, towing a trailer or carrying out the most demanding road maintenance tasks. We design hook ends, hook eyes and locking systems so that they are as easy to use as possible regardless of the conditions. We are aware that implements are not only used inside clean manufacturing facilities. This enables us to produce simple and effective products. For the same reason, we use testing methods that give us certainty of their reliability even in hard use situations. Our easy-to-use and safe locking mechanisms keep implements steady even in hard use situations – yet they are easy to detach when the work is done. Our goal is also to decrease the need for various tools in coupling. Most tasks can be done easily without extra tools. 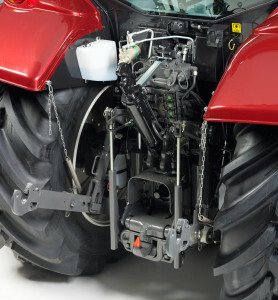 We also develop methods that enable a tractor driver to couple implements without leaving the tractor’s cab. Tractor couplings are heavy and can cause hazards when detached accidentally from a tractor. Therefore, we make sure that the user will know when the LH Lift locking mechanism is properly secured. Proper locking is indicated with audio or visual signals, helping the user to ensure secure mounting. Although our couplings are designed and tested carefully, we understand that any structure will become fatigued over time, which may cause accidents. Due to this, we extend the lifespan of our products by designing them so that it is easy to change the parts that fail most often.